Here's a unique way for a story to unfold. Cut identical size circles, one for each element of your story plus one more. Use one circle as the center of a flower; glue an appropriate picture or print the title of the story on it. Use the other circles as flower petals. Attach them to the center with staples. Print or put a picture of each story element on the petals (one element or picture on each petal) so they are in order clockwise. Then, beginning with the last element of the story and working toward the first element of the story, fold all the petals behind the center of the flower. Now you are ready to tell the story. Introduce the story with the center of the flower. Fold each petal forward as each story element is told. When the story is finished, the flower will be in full bloom. 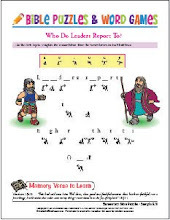 Help your Bible club students remember their lessons with this colorful idea. Design the lesson around a color featured in the lesson. (For example, blue can be used for a lesson about the children of Israel crossing the Red Sea, Jonah and the big fish, or Jesus walking on the water.) On Blue Day (or whatever color you choose) everyone must wear something blue. (Have some blue ribbons or bandanas available for children who don't wear blue.) Snacks must be blue; perhaps blue jello with gummy worms or brownies with blue frosting. Everything you do must have something to do with blue. What do you do as a follow-up to a color day? Why, have black-and-white day, of course! Let your Bible club students design their own party tablecloth. Use a flat, white, twin-size bed sheet. Place newspapers under it to prevent the colors from bleeding onto the floor. Use fabric markers or fabric paint for drawing or writing. Use acrylic paint in a shallow pan for hand prints. Personalize the tablecloth with everyone's signature. You can use the tablecloth again and again throughout the year for special events or to add interest to your room. If you wish, choose a central theme or make the tablecloth for a special occasion. When setting up visual displays in your Bible club room, don't limit yourself to bulletin boards. Other possible display areas include the classroom door, the sides of a desk, the sides of a file cabinet, or the back of a piano. You can use large cardboard boxes for movable stand-up room displays. You can even create sandwich boards for your students to wear. If you feel adventurous, use the ceiling or tape your visuals under a table, and have everyone lay on the floor for the lesson! Ordinary things out of place are funny to primaries. Mix things up during your Bible club meetings. Do things backwards. For primaries, silly is fun. When you plant a seed, don't use a flower pot (that's too ordinary); plant your seeds in an old tennis shoe. Keep your Bible story visuals under your hat or ball cap. Let the students erase the memory verse on your whiteboard using squirt guns filled with water (one word at a time), then say the verse from memory. Those are things your students will talk about! Most people only talk about making the world a better place, but you are doing something about it! By serving as a Bible club leader, teacher, or helper, you are impacting the lives of children. In a series of experiments on the moral development of children, a significant discovery was made: children who are enrolled in Sunday school showed significantly better conduct in the areas of honesty, cooperation, persistence, and inhibition of undesirable behavior! How important is this week's lesson? You are making this world a better place. You are shaping the future! Your Bible club students are making tremendous intellectual progress. By elementary school they can manipulate data mentally, come to some logical conclusions, and define, compare, and contrast things. But they still do not understand symbolism. After touring the defense plant where her daddy worked, one first grader resisted when told it was time to go home. She cried, "But I haven't seen where Daddy makes the money yet!" When teaching elementary school children, say what you mean and mean what you say. Always teach them in literal, concrete terms.